The latest campaign for the John Varvatos brand features music legend Jimmy Page, the guitarist of "the greatest rock and roll band of all time" Led Zeppelin, paired with the 28-year-old emerging American music talent Gary Clark Jr. 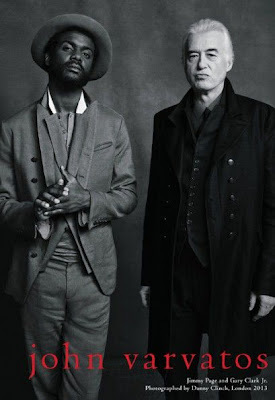 The images and short film were shot in London by Danny Clinch, against a textured backdrop at the historic Rivoli Ballroom, where the two sharply dressed subjects stand out in iconic black and white portraits. Self-taught from the age of twelve, English guitarist, songwriter and record producer, James Patrick "Jimmy" Page has been inducted into the Rock and Roll Hall of Fame twice - for The Yardbirds and Led Zeppelin - one of the major driving forces behind the rock sound of the 1970's, influencing a host of other guitarists and countless rock bands. Born and raised in Austin TX, Gary Clark Jr. has played the guitar (like Jimmy) since the age of twelve and is described by The New York Times as "the next Hendrix." Influenced by blues, jazz, soul, country and hip hop, this young musician is a natural triple threat guitar-slinger, emotive singer and involving songwriter. Gary notes, "It was an honor to work with John Varvatos on his new campaign and to be paired alongside a legend like Jimmy Page for this shoot." "Jimmy Page has been a music and fashion icon of mine since 1970. He has been a major influence and I am honored to call Jimmy a friend," says designer John Varvatos. "Gary Clark Jr. is the real deal – amazing guitar player, singer, songwriter and friend. Having 'The Master' and the 'Young Guitar-Slinger' together in our campaign is a dream come true." This latest John Varvatos campaign follows 17 seasons, all of which underscore the brand's affinity for rock 'n' roll style-makers. Past collaborators have included Paul Weller and Miles Kane, Green Day, Franz Ferdinand, Perry Farrell of Jane’s Addiction, Alice Cooper, Iggy Pop, Chris Cornell, Joe Perry of Aerosmith, Ryan Adams, Slash and more. For more information, visit Johnvarvatos.com.